Do you know those scenes in the movies where the music is telling you that everything is perfect and that these are happy moments? Like in one of the old Jacobs Krönung coffee commercials? Well, the thing is, that most of the time we wait for those happy moments to happen to us, instead of making them happen for ourselves. I’ve heard that before and I thought it was a lovely premise, but last week it occurred to me that I could simply test it. Is it true? After all, I am more than interested in a happy life, FULL of those happy moments. So could I make it happen more often? And how? We were slowly making our way back from Sri Lanka, waiting for a taxi to pick us up and go to the airport. All packed, with suitcases downstairs, both me and my partner were sat by a table in an air-conditioned room. Gathering our strength for a long journey ahead, we were both playing with our phones, waiting for time to pass. Then I looked up through the window and it hit me. I’m about to leave this very hot and sunny country for a cold and possibly not-too-sunny London, where nature is still waiting for spring to come. And. I’m. Sitting. Inside. So without hesitation, I got up and went outside. I found a few steps to sit on and closed my eyes to let the sun touch my face for the last time before leaving. I could feel my happiness levels rise within seconds. I ended up getting out my headphones and playing my favourite playlist too. And then I did indeed get out my phone, like I had before, but it was an entirely different experience. I was aware of where I was, I was smiling “with my liver” (if you don’t know what it means, watch Eat, Pray, Love) and I decided to catch up with some friends, writing messages about my holiday. Thus I anchored that positive experience with some positive writing. The premise worked. I was able to turn a seemingly dull moment of waiting for a taxi into an experience. Making the use of those last moments of this trip was just sending me through the roof with happiness. Not too bad for an outcome of an innocent experiment. How many moments do you think pass us by in that dull manner, when quite easily we could take actions to make those moments matter? To make them into an experience? And finally, to experience happiness? I thought about it some more and here are my tips on what YOU could do to create your happy moments (and I promise, there is no need to go to the other end of the world for that, you can as easily re-create the same experience at home). Turn your face to the sun. Sit in a different corner of the room. Use that seat you barely ever sit on. Make a change. Notice it. Take a different point of view (quite literally). It does not have to be the sun. You could use some candles or turn on fairy lights to change the mood with a switch of a button. 3. Play your favourite song. 4. Grab a lovely snack or a delicious drink. Do I need to say more? Foods and drinks can put us in a truly different mood. But don’t go for the same old chocolate that you treat as comfort food. Think of something that you would serve to a friend on a special occasion. Because your body is your friend. Do something that you feel like doing. Write, paint, dance, sit and contemplate nature. The purpose of this activity is to really be in that moment with all your thoughts. Let yourself feel inspired. Experience the happiness filling your body. Smile. Now, I want to challenge YOU to transform a potentially dull moment into a happy experience that will still make you smile when you’re falling asleep that night. Leave a comment with an idea of one moment that has undiscovered potential to be a truly happy one. (It could be while you’re at home, or perhaps outside.) Choose a moment that will be only yours and think of two concrete ways in which you could turn that experience into a happy moment. A moment – waiting for the coffee to brew. Now it’s your turn. What will you do? Think quick and leave a comment below. And then let loose a little. Connect to that fun that I know you’ve got inside you. 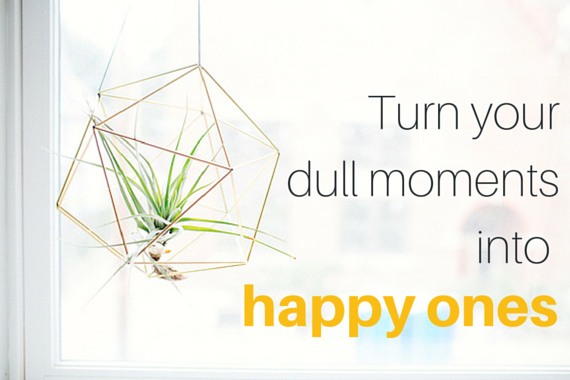 Turn a dull moment into a happy one. If you liked this article, please share it with your friends on social media :) Let’s spread those happy moments! One at a time. Pretty nice article, Kat. I really enjoyed it! Well, here is my thought. I am using public transport almost daily and it is really boring, but sometimes I try and imagine all the people I see naked. Trust, me it´s really really funny! Try it! Nagwa, that’s a really great way of taking yourself away from those discussions (and, let’s face it, political usually means they’re full of negative energy, too). So well done on escaping those moments and finding a happier way of using them!